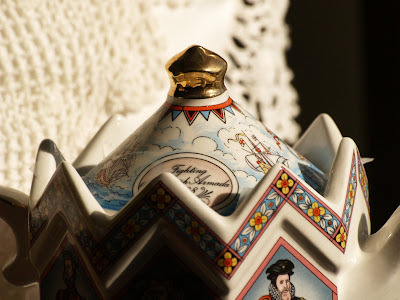 I posted 'My Treasures' in March 2010.
designing my blog and learning to take photos. During September 2013, I started to label my posts. This vintage post accidentally was published instead of reverting back to the original date...Today (Sunday) I thought this post would be perfect to publish. Downton Abbey is my favorite program and I love all things vintage. Hope you enjoy my story and some vintage things too. I am so happy to share my vignettes with everyone. This is my favorite treasure. The cup, saucer and dessert plate. I collect different tea sets for my tea party business. I found this C.H. Field Haviland Limoges set at an estate sale. It is in near perfect condition. There was just one set. Lucky me! 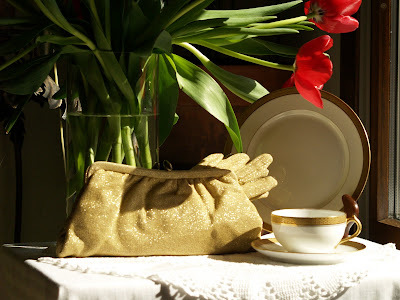 My evening purse and gloves are another find from the estate sale. The gloves fit a very small hand, but I love the style. 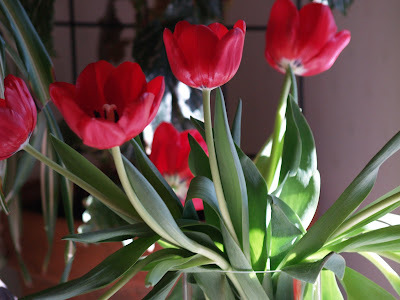 The beautiful red tulips were a gift from my sweetheart on Valentine's Day. Fabulous. A closeup of the beautiful flowers. I love this simple tea pot and matching cups and saucers. I also found these at an estate sale one rainy day in January. I love to sit by this sunny window and enjoy my cup of tea. "The Garden Gift" by Maureen Love is another favorite treasure. I also found these vintage satin boxes at an estate sale. They are wonderful for storage and great to use for lingerie or jewelry. I think this tea pot is a James Sadler. I cannot find one that looks exactly like it, but the style looks the same as a Sadler. 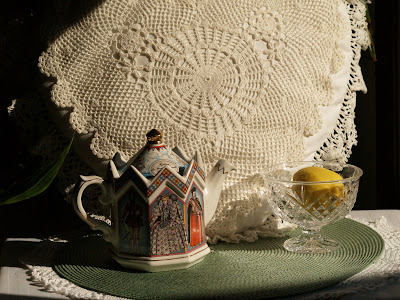 The lace pillow came from my bed and the lemon is from my mom's lemon tree. 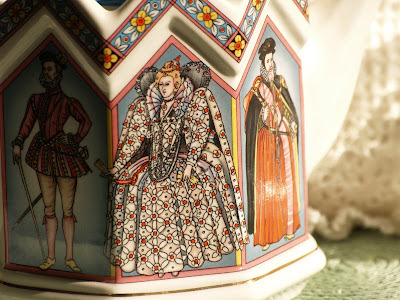 Fighting Spanish Armada 1588 is on top of the tea pot. My final treasure is this vintage tea pot I have had for 50 years. 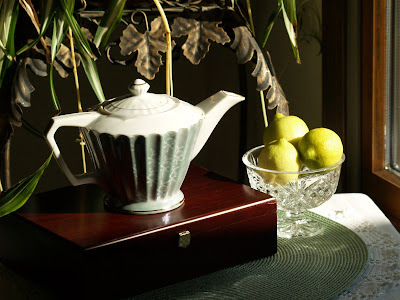 My tea box is filled with my favorite English tea, and the lemons are from my mom's tree. Lemon is so good in tea. I'm linking to Marty's Tabletops Tuesdays please go there and see some great ideas for decorating. Thanks for visiting , I hope you enjoyed my treasures. Some of the things I've sold and some things I still own. It was so much fun sharing with you an old post that is still new today. I love the matching tea cups--so cute. You have some really interesting teapots too! Oh, those tulips are so pretty. I also love your teapot. Thanks for sharing. Found another Sadler teapot on UK ebay! 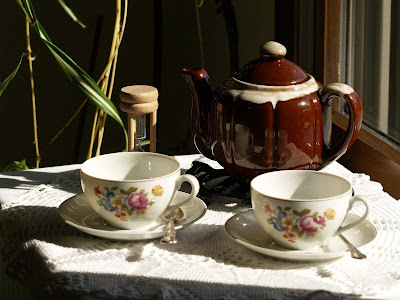 You have collected some really nice vintage tea things over the years. I think we all grow with our blogs, learning what we were afraid to try at the beginning and from other bloggers who are quite good at explaining how to do certain aspects of blogging. Happy New Year Betty! 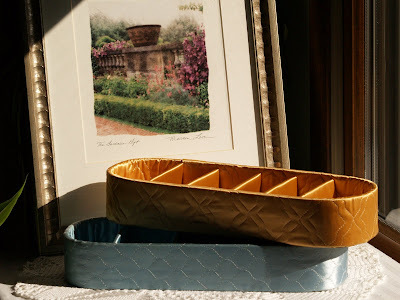 Your vintage treasures are just wonderful and I'm so happy you have shared them with us. My first blogging photos were pretty sad but I have learned so much the past few years from all my blogging friends. Thank you for sharing and have a lovely week. Amazing and thoughtful detail in each vignette. Wonderful to have you celebrating the New Year at Seasonal Sundays.